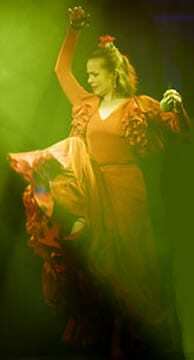 Juani studied flamenco at an early age in Madrid and then Sevilla, before returning to the UK to continue her career. In her professional career, Juani Garcia has worked with the Paco Mundo Company in Madrid, Mallorca, Malaga and Portugal. She has since performed worldwide and extensively throughout the UK. As a choreographer, performer and guest teacher, Juani’s work has taken her to Norway, Trinidad and Tobago and on extensive trips to India and the USA. Juani has appeared at the Royal Festival and Queen Elizabeth Halls and the Barbican Theatre in London. She has also performed on many TV shows and in festivals worldwide including tours of Pakistan and Sri Lanka. She has taught dance courses in Mijas, Malaga in Spain and also performed at several festivals in Andalucia and held several workshops and courses at the opera house in Budapest. Juani has featured in a dance drama, ‘El Caballo de Espana’, a lavish production combining the Feria horses of Sevilla with flamenco dancing. She has also taken part in the mega-production of the opera ‘Carmen’ in Birmingham and Germany. This year she has been invited to Canada and the USA for flamenco shows and will be holding workshops and teaching in Las Vegas. At the present time, Juani is the principal dancer with the Viva Flamenco dance group and company performing around the UK and abroad.